Dr. Bill McCaw was born and raised in Fayette County. He went to Eastern Kentucky University before being accepted at the Auburn University College of Veterinary Medicine. After graduating from Auburn in 1974 he opened a practice in Jessamine County which is now known as McCaw Veterinary Clinic. Dr. McCaw lives in Nicholasville with his wife Jean and their Cavalier King Charles Spaniel named Cami. You will likely see her in our front office, because she “comes to work” often. They have four grandchildren who live locally and they run a small cattle operation on the side. Dr. Will was born and raised in Nicholasville. He attended Auburn University and received a Bachelor of Science in Agriculture before being accepted into the College of Veterinary Medicine there at Auburn. He graduated in 2001 and returned home to practice at McCaw Veterinary Clinic with his dad. His veterinary interests include surgery and dentistry. Dr. Will lives in Nicholasville with his wife Laura and their two kids: John and Lily. They also have a bulldog named Abby who “comes to work” as often as possible. Look for her in our front office when you are in the clinic! Dr. Twehues is from Grant County, Kentucky. Dr. Twehues comes from a family filled with members of the medical and veterinary profession. His brother, brother in law, sister in law and father are all veterinarians. Dr. Twehues attended the University of Kentucky before getting accepted into veterinary school at Auburn University College of Veterinary Medicine where he graduated in 2014. Dr. Twehues' interests include surgery, internal medicine, ultrasound and oncology. He currently resides in Nicholasville with his wife Kelsey, 2 sons Colt and Jake, and the newest baby daughter, Taylor. In his spare time, Dr. Twehues is also a full-time cattle farmer, enjoys hunting and of course, Auburn football. War Eagle! Abby Reeve moved to Kentucky from Missouri in June of 2010 to assist their good friends with a local church plant (St. Aidan Anglican Church) and joined our team the following August. She lives with her husband Jeremiah and her two cats, Gidget and Penelope, here in Nicholasville. Ryan was born in North Carolina and moved to Ireland when he was 10 yrs old. He moved to KY when he was 18 yrs old and has been living here ever since. His interests include mountain biking, running, and other outdoor activities. He has 4 furry children named Sasha, Scout, Sawyer and Milo. He joined our team in 2014. Brooke is originally from Nicholasville, but currently resides in Garrard County with her husband, Ty. She received her BS in Biology from the University of Kentucky. Her interests include bee keeping, traveling with her husband, camping and visiting with her new baby grand-daughter. Brooke's furry children consist of 3 dogs and one kitty. She joined our team in February, 2014. Dawn has lived in Lexington for almost 20 years. She attended the University of Kentucky and received a Bachelor of Science with a major in Animal Science and a minor in Entomology. She graduated in December of 2005. She joined McCaw Veterinary clinic in July of 2006. Dawn is our resident “cat whisperer” – she has a fluctuating number of kittens and cats in her home because she fosters for several different organizations. If you have a kitten or cat question – she likely has an answer! 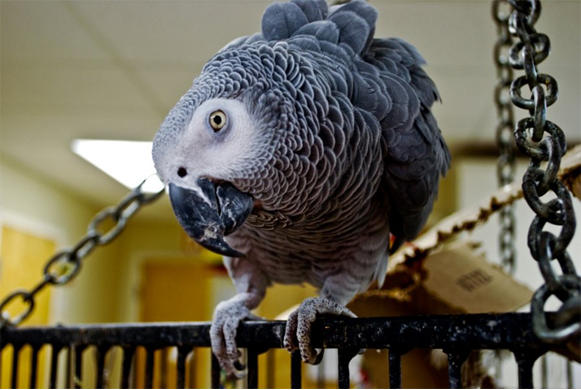 If you've been into an exam room at McCaw Veterinary Clinic, you may have heard odd noises coming from behind the door. Never fear, chances are it is from this creature. This is "Rudy." 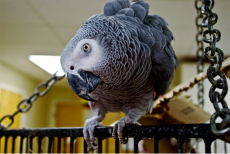 He is an African Grey Parrot and is estimated to be nearly 40 yrs old. A client gave Dr. McCaw Rudy around 1980, and he has been keeping our patients and clients entertained ever since! Teller is the newest member of our McCaw Veterinary Team. He received his cute name because he used to peruse the streets of Nicholasville down by a local bank. He was even known to sneak in the building when the staff members entered the bank. One of the tellers brought him to us in January 2017. He quickly became part of the family, and he we haven't been able to part with him. So, with that being said, Welcome to the family "Teller!"